The second week of 30 Days of Biking has come and gone. There was riding every day. On Easter Sunday, the wife and I rode to my parents’ house to eat, drink, and watch the nephews hunt for brightly colored plastic eggs full of corn sugar. On Friday the 13th, I finally got myself out of the house early enough for a few extra miles on the way to work. Rode through the Arboretum and observed many creatures of the avian persuasion. On Saturday the 14th, the Church of the Spoken Word convened for a rare Saturday service. 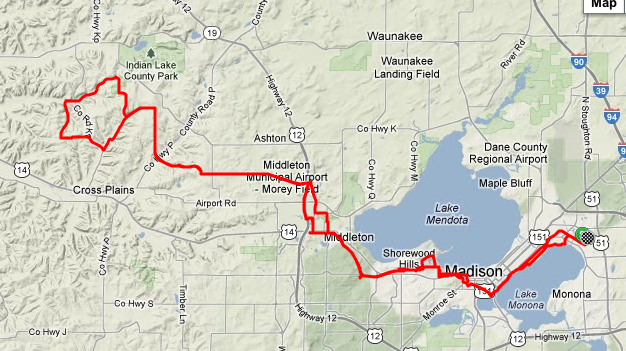 Four of us rode into the hills west of Madison, rode some of my favorite roads (Enchanted Valley, Otto Kerl, etc. ), checked out the goats at Dreamfarm, and stopped for coffee at Barrique’s in Middleton. Sunday: wife riding alongside, nephews hunting eggs, and the wind gusting through the marsh. Tuesday: well-worn black carhartt dungarees, ducks surfing the waves, the wind whistling through my front wheel. Wednesday: Brabantse Pijl in Flemish, squeaky chains on $3k road bikes, and beard-shadow blowing in the wind. Thursday: huffing wheelsuckers on the path, myriads of daffodils, and high heels on pedals (tres chic). Friday: bluebells blooming, turkeys gobbling, and 14 different avian species on the way to work. Saturday: goats, hills, and Hammer Dan dropping his chain on the hills.